Graded VG 40 by SGC. 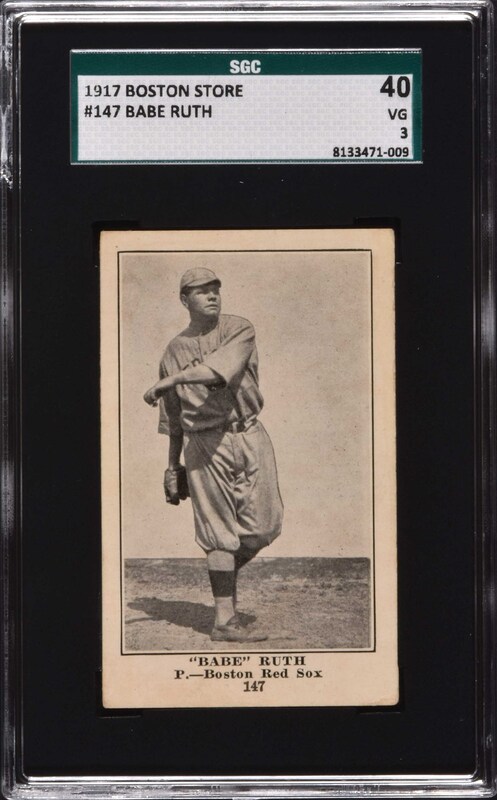 Presented is an extremely attractive H801-8 Boston Store card of Babe Ruth, one of Ruth's most significant, rarest, and in our opinion, most overlooked cards. We think the reason this card doesn't get the attention it deserves is simply because it is so rare. This is one of the premier early Ruth cards and one of the very few dating from the beginning of his legendary career. This is only the second example of this important card that we ever offered in the last fifteen years. 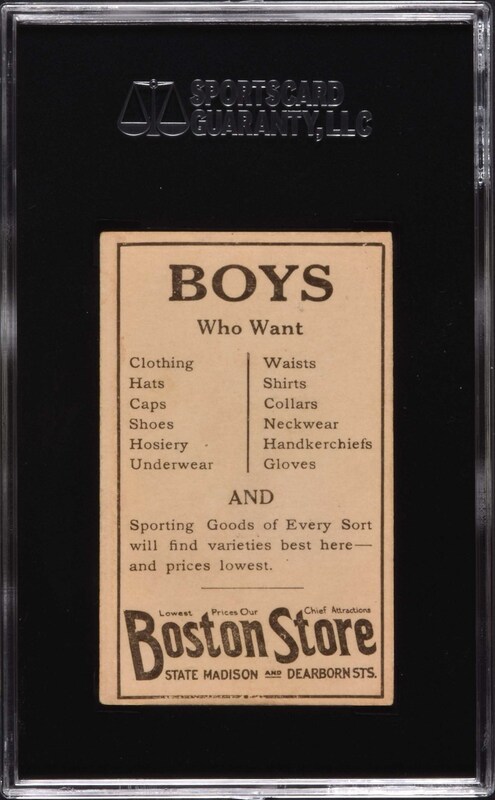 1917 Boston Store cards are one of the few major card issues dating from the mid-teens. They are somewhat similar in design to the M101-4/5 Sporting News cards, are from the same general era, and also have 200 cards in the set, so they are somewhat overshadowed by the popular M101-4/5 issues. H801-8 Boston Store cards, however, are considerably rarer, and were never issued as complete sets to the public. They are usually encountered only in small groups and usually in low grade. They were also produced on a slightly thinner stock (compared to M101-4/5) that is far more susceptible to wear, and with a very glossy surface, which is very prone to creasing. This is a magnificent example of Babe Ruth with tremendous eye-appeal. The card is very well centered, with outstanding image quality, light wear on the corners (more so on the lower right), and a very faint diagonal crease visible on the lower right portion. The important advertising reverse is boldly printed. The image on this card is an early pitching pose of Ruth. It is interesting to note the image on this card is the very same used on Ruth's 1921 E121 American Caramel candy card. This is an exceptional example of one of Babe Ruth's most elusive cards dating from very early in Ruth's career, and an extreme rarity that would be a highlight in any world-class Babe Ruth or vintage-card collection. Reserve $25,000. Estimate (open).